You may have become familiar with contactless card payments, but the next step in contactless requires no more than your phone. Samsung Pay, much like Android Pay or Apple Pay, is one such app that means quick and simple card payments can be made straight from your phone, meaning that along with being cashless, we may well be on our way to being a completely wallet-less society! Samsung Pay is a payment app designed for the latest Samsung model phones, just as Apple Pay is designed for iOS. It works in the same way as other digital wallets and allows you to store your debit or credit card in your phone, which you can then use to pay for things by holding it over a card reader. Samsung Pay is also compatible with loyalty cards and gift cards, so you can store all your cards digitally and have your funds easily accessible from one single app. All payments made will be stored in the app, helping you keep track of your purchases. You can use Samsung Pay in any shop that accepts contactless payments and updates and offers from businesses using Samsung Pay can even be browsed from the app. The exclusivity to its latest models has to do with the levels of Samsung Pay’s security, which requires the hardware needed for biometrics, i.e. an iris scan or fingerprint to authorise payments. Your cards are now ready to be emulated, head out to any shop and pay by holding your phone over the reader while pressing your finger to the home button (debit cards may also require you to access their PIN number). Cards stored in Samsung Pay are still protected against fraud by their issuing banks, and if your phone is lost or stolen you can lock your cards or erase them from your phone using Samsung’s Find My Mobile service. Every card uploaded to Samsung Pay is also protected by tokenization, this means that your real card number is represented by an ever-changing series of figures, so no purchase ever uses the same information, meaning even if fraudsters got a hold of your purchase data, the card number used will have changed multiple times since then. Samsung Pay uses the Knox system to implement these security measures, the same platform trusted by the UK government for their own digital security. Samsung’s most obvious competitor is Android Pay, which is compatible with Samsung phones that are Android 4.4 and above. Samsung Pay offers Samsung users another option for adopting a digital wallet. One significant difference between Samsung Pay and its competitors is in its technology. While other digital payment systems work with NFC technology which requires shops to have contactless-enabled card readers Samsung can also accept Magnetic Secure Transmission (MST) payments. While this hasn’t yet been rolled out in the UK, this notable addition to Samsung Pay’s technology means that any payment terminal that accepts cards will accept Samsung Pay, so even if you go to a shop not enabled for contactless payments, the app can still present your card in its magnetic stripe form and complete a payment. There are some exceptions to this, such as cash points which require cards to be completely inserted into the machine. Want to accept Samung Pay payments at your business? 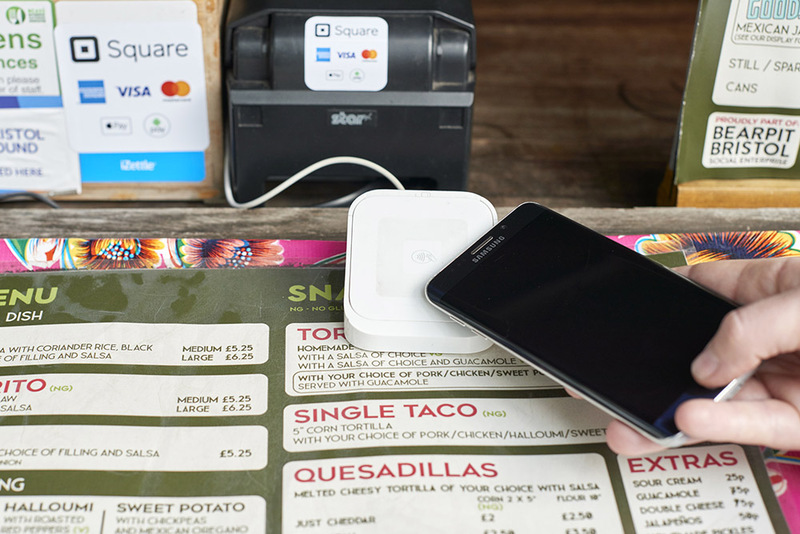 You’ll need a contactless card reader — Square Reader costs just £39 + VAT and allows you to accept Chip and PIN, contactless and mobile payments including Samsung Pay.